Recently I’ve heard marriage described in this way: What if God designed marriage not so much for our happiness as for our holiness? This places the husband & wife as the vessel of God’s purposes instead of the self oriented worldly focus of wanting our mates to make us happy. Love isn’t about us; it is really about God. Further, our marriage represents two divinely inspired roles: the husband stands in the place of Christ Jesus; the wife stands in the place of the Church. A marriage that is properly aliened with God’s design has a far better chance of finding true fulfillment. When we are practicing holiness to the Lord and each other the likeliness of being happy dramatically increases. Divorce at its core is the result of the hardness of hearts. Holiness is about subjecting oneself willfully to God and then each other. With this kind of love being practiced in the marriage, it will succeed. Keeping first things first: It’s about attention! 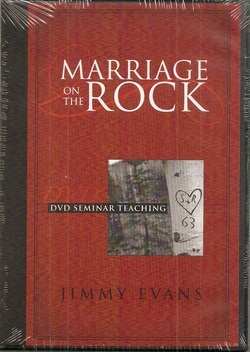 Highly Recommended - DVD Series "Marriage on the Rock"
Society requires years of preparation for almost any significant career endeavor, but demands no real preparation for one of the most crucial undertakings in life: marriage. In an age of disposable marriages and information overload, where can couples turn for real answers that will make their relationships work? Only to God. Having trouble loading the resources? Click Here for Adobe PDF Reader. Four main principles to keep your marriage safe, protect, and be secure. This is a great message about offenses, holding grudges, judgmental attitudes that destroy relationships and is vital in marriage. Love in action; Love in commitment. We spend the most time with what is important to us. Leaving and instilling a godly heritage! Our children will catch far more than we teach in this area of life and training. Biblical principles to judge true friendships and the basis for a true marriage that lasts. We all have bosses. Even if we are self employed we are under the laws of the land, paying taxes, and accountable to customers. Our sin nature doesn’t want one; we dream of a time hopefully in the not too distant future of being our own boss. The truth is that we will never be out from under a “boss.” Look at it another way, although bosses are in authority over us, (They tell us how to work, what work to do, and generally when to do it), we are subject to bosses and authority because God wants it that way. Ultimately, God is our boss and authority. Highly recommended is this International Ministry located in Colorado Springs, Colorado. Dr. James Dobson and Focus on the Family has been ministering for over thirty years. Countless millions of families, parents, and children have been blessed through their efforts. This ministry is fully comprehensive addressing ALL areas of marriage & family life:. They have a daily Radio Broadcast in our area too!